Hillary Rodham Clinton prepares to sign copies of her book "What Happened" at a book store in New York, Tuesday, Sept. 12, 2017. Hillary Clinton will speak about her new campaign memoir "What Happened" in Washington, D.C. on Monday -- and tickets for her sold-out appearance are available online for 12 times their original value. Tickets to the book event at the Warner Theatre originally sold for $55 to $75, which included a copy of the book. Multiple ticket resale websites now have them for sale for as much as $897, for up-close orchestra seats. Resale websites and Craigslist advertised seats further from the stage for $150. Clinton will talk about her failed bid for the presidency, with Lissa Muscatine, a Politics and Prose co-owner who served as Clinton's chief speechwriter at the U.S. State Department and the White House. Clinton is set to speak about the campaign, her relationship with then-candidate President Donald Trump and how she has moved on after losing. The book tour will make stops in Chicago, New York, Atlanta, Boston and Portland, plus cities in Canada. Additional cities could be added to the tour as they are confirmed, according to the book tour's website. The tour is set to end in Vancouver on Dec. 13. 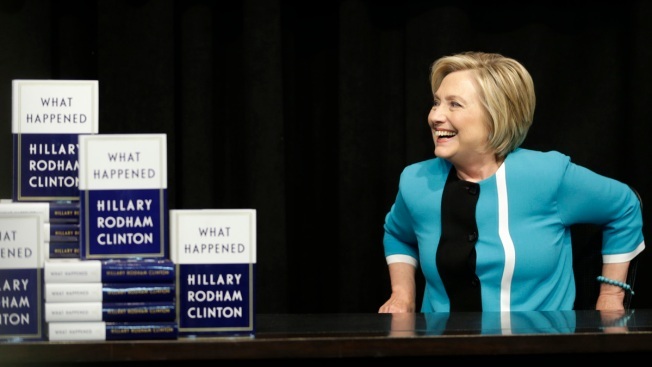 For the full list of dates, locations and tickets for "What Happened" across the country, see Clinton's book tour website.